Tomorrow is St. Patrick' Day and I am sure everyone is getting their green out to avoid being pinched all day and of course I am no different, but that will be in tomorrow's post. Ha. Today, I am bringing you a trend that first started in the1940s and then was reincarnated in the 80s and now it is making its third visit to planet earth and the fashion world is all over it--peplum. What's that, you say? Oh, its a gorgeous silhouette that nips in the waist accentuates the hips and tush and gives every wearer a beautiful hourglass figure a la Marilyn Monroe.. Every girl's dream, of course. So, dust off your 80s gear, vamp it up and take it for a spin one more time. 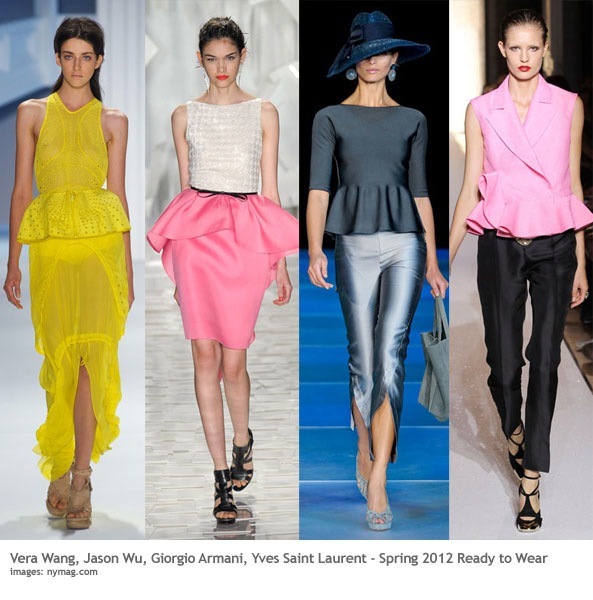 And if you don't have a peplum piece in your closet, well, here are some awesome ways to incorporate one this spring.